Yesterday, we looked at the performance differences between men and women across the entire range of distances from 100m to the Ultra-marathons, in an attempt to see whether the theory that women are better long distance runners than men is true. Yes, we acknowledge that there are flaws in this method, because far fewer women run the long distance events in particular (which reduces the depth of ability available), and also women have only been running for perhaps 40 years, compared to almost 100 for the men. However, that analysis showed that rather than catching up to men as the distance gets longer and longer, women (the world’s best time, anyway) are in fact always about 10% slower than men. The reason for that at the shorter distances is the testosterone advantage enjoyed by men (called the ‘hormone gap’ by one scientist! ), very interestingly demonstrated by the observation that in the last 10 years, as drug testing has become tighter, women are in fact falling even further behind the men than they were in the 1980’s, when women were arguably pumped full of steroids! So we concluded yesterday that it is highly unlikely that women will ever catch up to and then pass men, at least when we look at the very best men vs. the best women. However, having said all this, what if we now suggested that this probably isn’t the only or the best way to go about answering the question “Are women better distance runners than men?” Because really, what we are doing by comparing world records is comparing apples to pears, to use a cliché. Does it answer the question to know that Haile Gebrselassie’s world marathon record is 8% faster than Paula Radcliffe’s? And does the fact that Kenenisa Bekele’s 5000m world record is 10% faster than Meseret Defar’s really mean men are better than women over distance events? Only partially. About ten years ago, in an attempt to answer this question, scientists from UCT looked at a large group of runners from the Two Oceans and Comrades marathons. They found out what the runners’ best performances were at distances ranging from 5 km all the way up to Comrades. And what they found is shown in the Figure below. 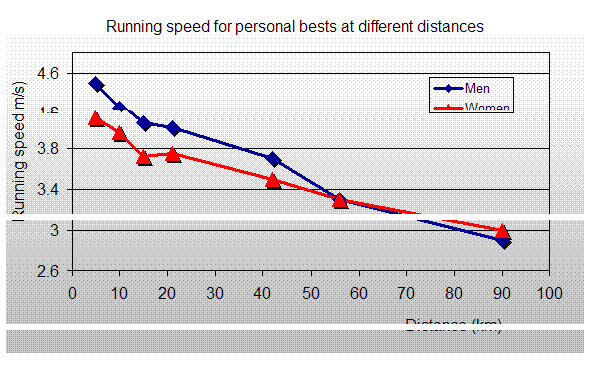 What this graph shows is that when you look at the SAME person across a range of different distances, then you find that the running speed is higher in the men from 5 km up to 56 km, but that the gap between men and women decreased progressively, until eventually, we hit the Two Oceans at 56 km, and then the men and women run at the same speed! Go one step further, to Comrades, and the women are faster than the men! Remember, the difference between this method and the world records we looked at earlier is that here we are looking at the same person across a range of distances, not the fastest single person in each event. In other words, we’re asking whether a woman who runs as fast as a man at shorter distances is more or less likely to catch up over longer runs. And the answer is a resounding yes! The implications – choose your distance! Now, many of you are thinking, well this obvious, because all the physiological advantages we put forward for men yesterday – testosterone, more muscle, lower body fat, larger hearts, more oxygen-carrying red blood cells etc. are likely to have an effect in the shorter events. But as the distance increases, those advantages are eroded, and so a woman who is comparable over a shorter distance will come into her own at the longer distances. Let’s take the example of Bob and Alice, who both regularly do club time-trials. If they run a 5 km or an 8 km time-trial in the same time, then whenever they run a 21km race, the safe bet is Alice to win, because she gets relatively stronger as distance increases. And if they both ran Comrades, then it’s a pretty safe bet, most times, that Alice will finish ahead of Bob. The really interesting thing is that this works most times, assuming the run goes according to plan – as I’m sure you can appreciate, a lot can go wrong over 56 or 90 km, so this might not always work out perfectly. But, on the whole, women who are reasonably close to men in shorter races will find that they get to lead the way in the ultras. The next question is why? And there are probably two ‘categories’ of reasons that make women relatively better at the longer runs than men. The first is metabolic or energy related. During the ultras, the body’s main source of energy is fat, because the carbohydrate stores are limited in volume. Therefore, women have greater energy reserves to call upon and may even be better at making use of the energy that is available. At shorter distances, this is not a concern, since carbohydrates like glycogen are the main source of energy. Besides, the strength advantage possessed by men as a result of larger muscle mass makes them shorter distance kings. The second reason is differences in pacing strategy. In some fascinating research, it’s been shown that women tend to pace themselves more evenly than men, and seem to be less affected by external factors (like crowds, friends, rivals etc.) than men! In one study, researchers tried to confuse runners by manipulating a clock to run either faster or slower – the women were not fooled, they went about their business as usual. The men, however, ran either five minutes longer or five minutes shorter over about 30 minutes of exercise! Is it possible that women have a more finely tuned internal clock that allows them to judge distance and pace? Research needs to be done, but when you watch races on TV, the hordes of men who surround the lead women (often to get onto TV, true) benefit enormously from the steady pace they set. So that’s it in a nutshell. More than likely, women will never catch up to and beat men at the very top level, where the elite and world record-holders play. But for everyone else, women do seem to have a “relative” advantage over the longer distance events, getting progressively better than men as the distance increases for each person. The bottom line is that we all have strengths as runners – for women, it’s likely to be longer distance events. But setting aside the rivalries of gender for a second, one statistic that we do need to be aware of more than any other is that most of the growth in running in the last few years has been among the women. Inspired by health benefits and social aspects of running, more women are hitting to roads and treadmills than ever. The running community is stronger for it, that is for sure. It hasn’t quite made it to the Comrades marathon yet, where only 18% of this year’s Comrades finishers were women. But all these numbers and stats, and all the science show that women are just as good, if not better than the men at running, and over any distance. So here’s to continued growth in women’s running! At the very least, as a women runner, you’ll give a few men good reason to run faster!